In this chapter, the middle Eocene Dongying Depression located in East China is provided to serve as an ancient example for windfield-source-basin analyses. Basic sedimentology settings including main depositional systems and stratigraphy framework were first studied by using core data, well-log data, and seismic data. Under the guide of windfield-source-basin methodology, paleo-water depth, paleotopography, sedimentary patterns, and paleo-wind direction and strength were further reconstructed. 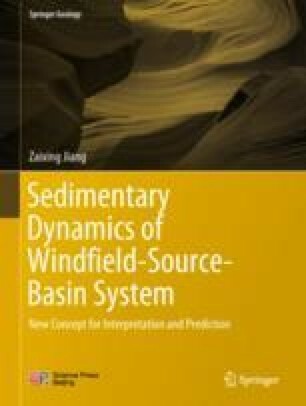 By coupling the paleo-environmental factors with distribution of various depositional systems, a classification scheme of depositional systems relating to the study area was proposed in the framework of windfield-source-basin system. According to results of paleo-windfield reconstruction, evidences of East Asian monsoon activities were found during the depositional period, i.e., the middle Eocene (~45 Ma).